After discovering that I had a number of old vinyl record albums, my son purchased this item from a nearby Best Buy store, to give to me for Christmas (admittedly, without any prior research). The outside of the box identifies the product as a "BLUETOOTH TURNTABLE," and has the words "BLUETOOTH CONNECTIVITY" as one of the features listed on the box. These are the only mentions about Bluetooth on the outside of the box. Since a turntable is an audio SOURCE, the wording on the outside if the box, of course, naturally implies that the turntable will transmit audio via Bluetooth to external Bluetooth headphones or speakers. BUT SUCH IS NOT THE CASE! It turns out that the "BLUETOOTH CONNECTIVITY" mentioned on the box is receive-only (from the Turntable's point of view), and only allows pairing the turntable with an external audio SOURCE, such as a smartphone or laptop, to play digital audio files over the turntable's amplified speakers (I.e. to use the turntable as a pair of Bluetooth speakers). In fact, the phonograph turntable does not even operate at all while the unit is in "Bluetooth" mode. However, this functionality is utterly useless because those teensy, tiny, tinny little speakers have virtually no bass response. So why would ANYONE want to even use this thing as Bluetooth speakers? Both my son and I were extremely disappointed that the turntable would not do Bluetooth pairing with external headphones or speakers, and we were also disappointed a the audio quality of the unit's speaker output. 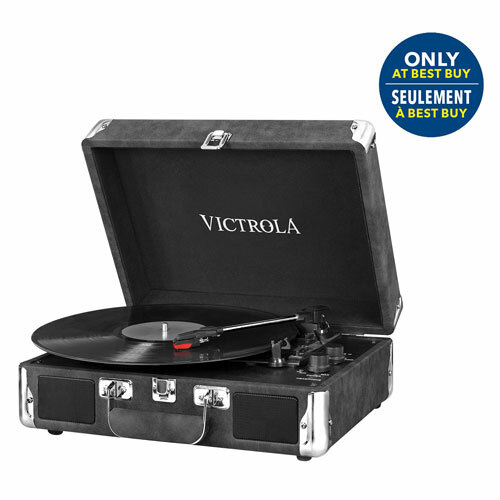 It is my belief that Innovative Technology (the manufacturers of Victrola turntables) have purposefully misrepresented their product on their packaging.